This onion tomato chutney makes a perfect side dish for idli, vadas and dosa. 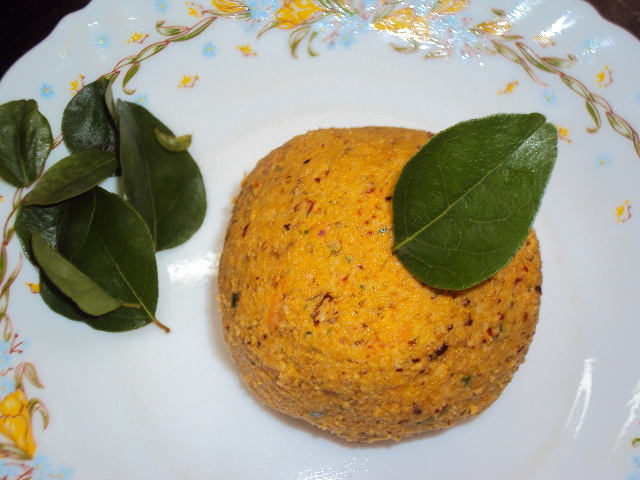 If you like more chutney recipes to pep up your hot steaming idlis, try coconut red chilli chutney, quick coconut chutney and easy pressure cooker sambar. Heat oil in a pan. Fry chana dal and red chillies. When chana dal turns light brown in colour, transfer this to a plate. Set this aside. Now add onion to the remaining oil and saute well. When onion turns translucent, add chopped tomato and saute well. When tomato is mushy, add coconut. Mix well and switch off the stove. Allow it to cool. Transfer this to a blender along with the fried dal and red chillies mixture, which is set aside. Grind this to a smooth paste. Transfer this to a serving bowl. Heat oil in a pan. Splutter mustard seeds, urad dal and curry leaves. Pour this over chutney. ഒരു പാനിൽ,2 ടീസ്പൂൺ എണ്ണ ചൂടാക്കുക. കടല പരിപ്പ് , ഉണക്കമുളകും ചേർത്ത് വറുക്കുക . കടലപരിപ്പ് ബ്രൗൺ കളർ ആകുമ്പോൾ ഒരു പാത്രത്തിലേക്കു മാറ്റിവെക്കുക. ബാക്കി എണ്ണയിൽ സവാള അരിഞ്ഞത് ചേർക്കുക. സവാള കളർ ഒന്ന് മാറി വരുമ്പോൾ തക്കാളി ചേർത്ത് വഴറ്റുക. തക്കാളി ഉടഞ്ഞു വരുമ്പോൾ തേങ്ങാ പീര ചേർത്ത് നന്നായി ഇളക്കി ഇറക്കി വെക്കുക . ചൂടാറുമ്പോൾ ഒരു ബ്ലെൻഡറിൽ ഇട്ടു , ഉപ്പും ചേർത്ത് നന്നായി അരച്ച് എടുക്കുക. ഒരു പാനിൽ എണ്ണ ചൂടാക്കി കടുക്, ഉഴുന്നുപരിപ്പ്, കറിവേപ്പില മൂപ്പിച്ചു ചട്നിയിൽ ചേർക്കുക. ഇഡ്ഡലി, ദോശ , വട ഇവയ്ക്കൊപ്പം കഴിക്കാൻ വളരെ നല്ല ഒരു ചട്നി റെഡി . Heat 1 tsp oil in a pan. Roast dry red chillies, but do not allow to change the color of red chilies.Roast chana dal and keep aside. Grind roasted chana dal and dry chilies to form powder. Now open the lid of the jar, add grated coconut, ginger, garlic, tamarind, and salt with water to form a coarse paste. Transfer the chutney into a bowl. Heat oil in a pan. Allow mustard seeds to splutter. Now add cumin seeds, dry red chilies, asafoetida, and curry leaves. Pour this over the chutney. Mix well. Serve chutney with idli, dosa, or vada. Mint chutney is a dip made from mint leaves. It goes well with appetizers like samosa, kebabs. cutlets, etc. It can be used as a spread on sandwiches and top it on chaat for spiciness. Wash and clean mint leaves and coriander leaves. In a blender, blend all the ingredients from above except lime juice. Grind in to a smooth paste. Add lime juice and mix well. Refrigerate. Tomato curry/ Thakkali masala is an easy side dish for Idli/dosas. Dry roast chana dal, red chillies and coriander seeds. In a blender, add this dry roasted ingredients, grated coconut, turmeric powder and salt with little water into a fine paste and keep aside. Heat oil in a pan. Splutter mustard seeds, add chopped onions and curry leaves. Saute well. 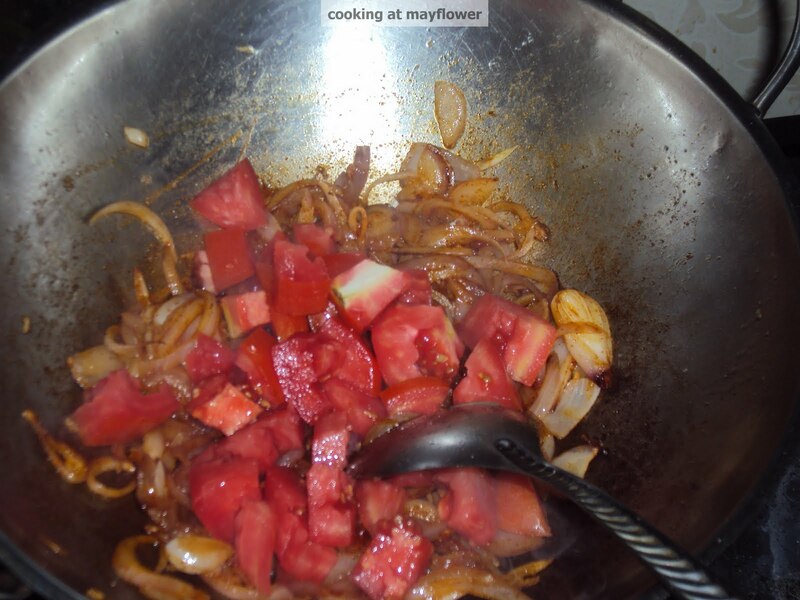 When onion turns to golden brown colour, add chopped tomatoes. Saute well till tomatoes are mushy. Now add ground paste, required water and stir well. Allow it to boil for 10 to 15 minutes till the raw smell leaves and the curry gives the form of a thick gravy. Switch off the fire. Garnish with fresh coriander leaves. Serve hot with idli and dosa. 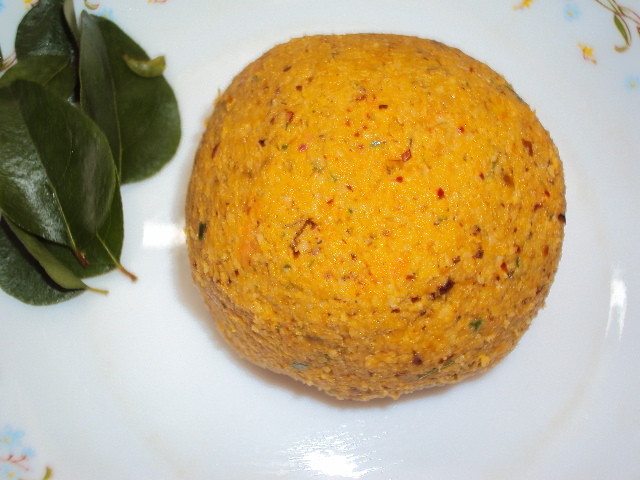 Chammanthi podi is a condiment from the Indian state of Kerala. 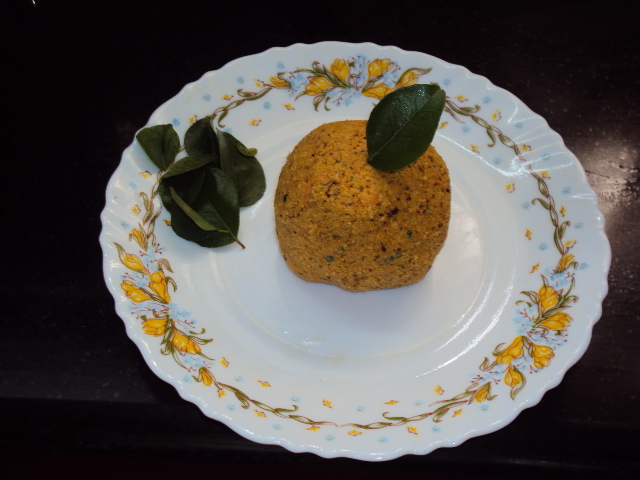 Regular coconut chutneys would spoil the same day with out refrigeration, Making chammanthi podi was a way to preserve chammanthi for months. To make chammanthi podi , shredded coconut and spices are dry roasted in a pan to help evaporate the moisture from the mixture. Then the mixture is ground up and stored to be used later. Heat kadai. 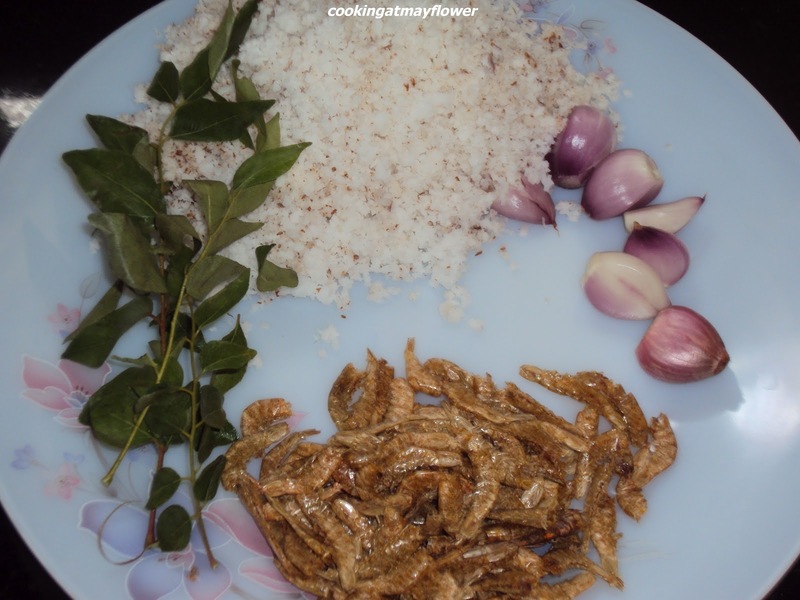 Dry roast (do not use oil) grated coconut, peppercorns, red chillies, urad dal, pearl onions, ginger and curry leaves. Stir them continuously on a medium flame. When the colour starts to change slightly, lower the flame, but make sure you are continuously stirring. When the coconut gets a deep brown colour, switch off the stove. This will take around 40-50 minutes. Keep it aside to cool for 20- 30 minutes. Add tamarind and salt. Grind to make a coarse powder. Store in airtight container. Heat oil in a pan. Roast chana dal. Keep this aside. To the remaining oil in a pan, add curry leaves and fry till they become crisp. Add all ingredients in a blender. Add little water and salt. Blend this to a smooth paste. Heat oil in a pan, fry red chillies. Transfer the red chillies, shallots and tamarind to a blender. Grind them coarsely. Now remove this to a serving bowl. Add salt, sugar and coconut oil to this. Combine every thing well and serve. Goes well with rice and kappa vevichathu. Saute shallots, dry red chillies, cashew nuts. Coarsely grind them without water. This is a good accompaniment with rice and chapatti. This chammanthi is easy to make.Quick side dish goes well with boiled rice and is best served wih kanji. Heat a pan and fry dried prawns over medium flame .Add red chillies, small onions, ginger and saute until its colour change lightly. Then add grated coconut and curry leaves. Saute till it becomes light brown in colour and turn off the stove. 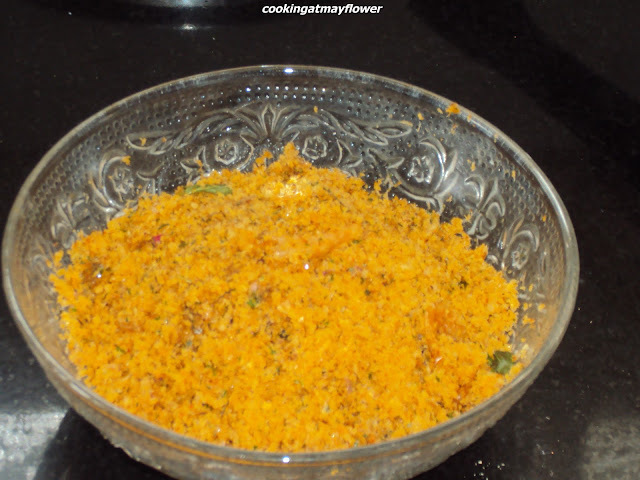 Grind coarsely all the ingredients with tamarind and salt .chammanthi is ready to serve . 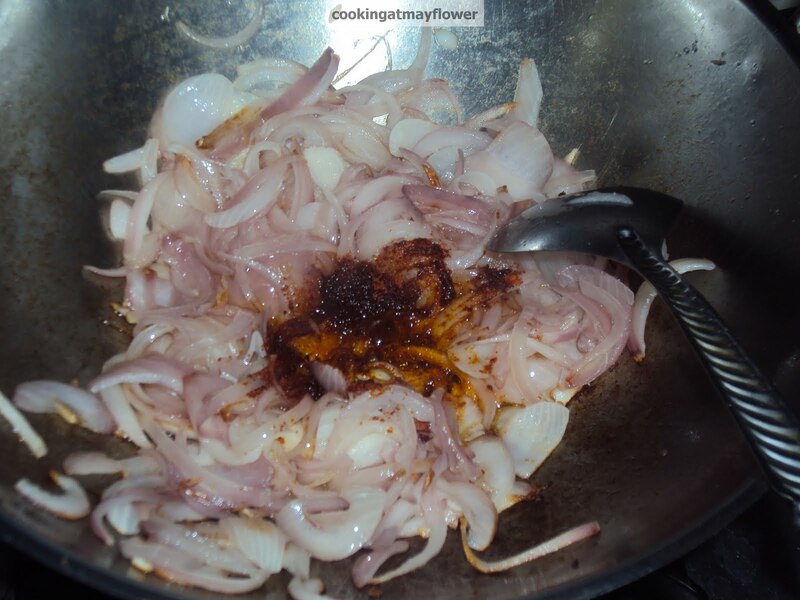 Heat oil in a pan and add chopped onions and salt. Saute well for 3 minutes, add chilli powder and saute on a law flame. Add chopped tomatoes and saute till it become mashe, Grind the mixture to a smooth paste in a mixer and add the reaming oil to the top. Green chilies - 2-3 nos. Grind all the ingredients by adding few drops of water to a coarse paste. Chammanthi is a good accompaniment for kanji and rice.